FOUNDING MEMBERS 1984 Back row, left to right: Robin Bucab, Sam Morello, John Bender, Syd Atkinson, Bob Caskey. Center row, left to right: Jan Hartrauft, Ken Kenyon, Pat Mishina, Jim Anthony, Gary Gebhardt. On floor, left to right: Tom Nuzum, ? 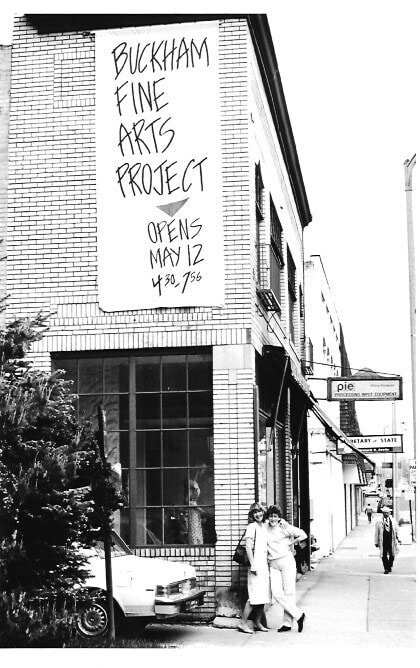 The Buckham Fine Arts Project was founded in late 1983 by a group of Flint-area artists, who sought to fulfill the city’s need for a local exhibition and performance venue that would direct its creative attention to presenting ambitious work. The Gallery’s purpose was, and still is, to make accessible contemporary arts in all media for the benefit of the public, as well as to enrich and enhance local cultural life by presenting works and concepts that are not being provided by other organizations in the area. ​After the inception of its cooperative membership, Buckham Galley mounted its first exhibition in May of 1984. In the ensuing years, Buckham Gallery has offered more than four hundred exhibitions of visual art and a substantial number of other events, including poetry readings, performance art pieces, concerts and film presentations. While these proceedings are mostly an offering to mid-Michigan audiences, it is not uncommon for national or international visitors to participate in the goings on of the Buckham Fine Arts Project. The Buckham Fine Arts Project has been supported since its founding by the considerable efforts of its artists members as well as individual and corporate contributions, fundraising efforts, and by means of other gifts and grants. With this strong support system still in place, Buckham Gallery remains dedicated to providing quality contemporary art to the public via its monthly art exhibitions, second Friday Art Walk receptions, and additional performance-oriented events.